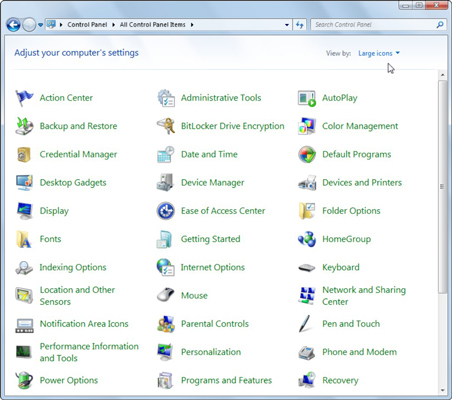 The Control Panel in Windows 7 is the place to go when you need to make changes to various settings of your computer system. You can control most Windows commands and features using the various options and sliders in the Control Panel. To open the Control Panel, click the Start button on the taskbar and then click Control Panel on the Start menu. 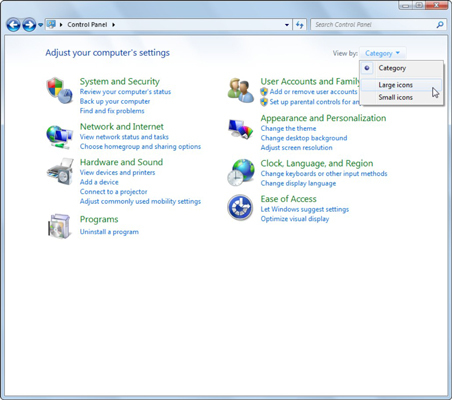 Windows 7 gives you three different views for looking at your computer’s Control Panel: To switch views, click the View By drop-down button (labeled Category by default) in the upper-right corner of the Control Panel and then choose one of the views from the button’s drop-down menu. By default, the Control Panel is displayed in Category view, which is separated into eight categories, ranging from System and Security to Ease of Access. 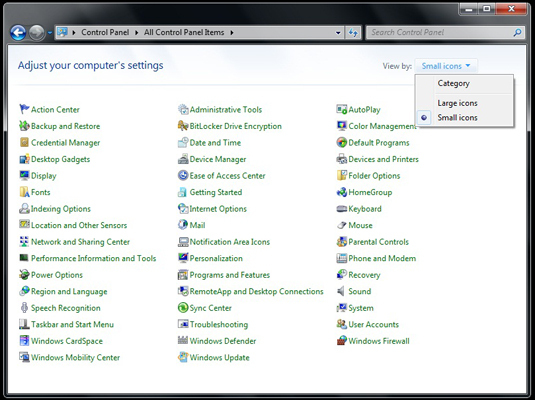 To open a window with the Control Panel options for any one of these categories, simply click the category’s hyperlink. The following table gives you a description of all the Control Panel categories, including the various programs you can find by clicking each category’s hyperlink. Click This Category Link . . .
You’ll notice that some Control Panel windows and dialog boxes can be accessed in more than one way. You can also find most Control Panel programs by doing a Start Menu search. The Control Panel’s other two views are Large Icons view and Small Icons view. When the Control Panel is in one of the icon views, Windows displays an alphabetical listing of the more than 50 Control Panel programs on your system, ranging from Action Center to Windows Update. To view (and possibly change) the settings for a particular Control Panel option in one of the icon view modes, you need to double-click the Control Panel program icon.